Editorial Comment: Although this article is dated, you will still find some useful pointers. This is a kind of service business with a virtually unlimited profit potential. Third year profits for businesses of this type, in metropolitan areas as small as 70,000 persons are reported at $100,000 and more. It’s a new idea for a traditional job that’s growing in popularity and acceptance. As for the future, there’s no end in sight to the many and varied kinds of work a secretary working at home can do for business owners, managers and sales representatives. Various surveys indicate that by the year 2,000 – at least 60 percent of all the secretarial work, as we know it today, will be handled by women working at home. If you don’t have a modern, office quality electric typewriter comparable to the IBM Selectric – a portable just won’t do, because it’ll break down, wear out, and fall apart after a month of heavy duty use. If you’re aware of this delicacy of a portable electric, you can conceivably begin with one, but you’ll definitely have to graduate to a bigger, heavier machine as soon as possible. An IBM Selectric, complete with start-up supplies kit which includes a dozen ribbons, can be purchased for less than a thousand dollars. On contract, this would break down to about $175 for down payment and monthly payments of less than $50 per month over a 2-year period. Naturally, you’d want to include the standard service contract which costs about $100 per year, and means that whenever you have a problem or want your machine serviced, you simply pick up the phone and call the service department. They’ll ask you what kind of problem you’re having, and then send some one out to rectify it immediately. Whatever you do, get the best typewriter your money can buy. The output of your typewriter will be your finished product, and the better, “more perfect” your finished product, the more clients you’ll attract and keep. It’s also imperative that you have one of the modern, “ball” typewriters. Only these kinds of typewriters give each character a clear, even and uniform impression on your paper. Typewriters of the “arm & hammer” type quickly become misaligned, producing a careless look on your finished product. As mentioned earlier, you can start almost immediately from your kitchen table if you’ve got the typewriter. However, in order to avoid fatigue and back problems, invest in a typing stand and secretary’s standard typing chair just as soon as you can afford them. Watch for office equipment sales, especially among the office equipment leasing firms. You should be able to pick up a new, slightly damaged, or good used typewriter stand or desk for around $20 to $25. A comparable quality secretary’s typing chair can be purchased for $50 or less. While you’re shopping for things you’ll need, be sure to pick up a chair mat. If you don’t, you may suddenly find that the carpet on the floor of the room where you do your typing, needs replacing due to the worn spot where the chair is located and maneuvered in front of the typewriter. You’ll also want a work stand with place marker and a convenient box or storage shelf for your immediate paper supply. If you plan to do a great deal of work during the evening hours, be sure to invest in an adjustable “long arm” office work lamp. When buying paper, visit the various wholesale paper suppliers in your area or in any nearby large city, and buy at least a half carton – 6 reams – at a time. Buying wholesale, and in quantity, will save you quite a bit of money. The kind to buy is ordinary 20 pound white bond. Open one ream for an immediate supply at your typewriter, and store the rest in a closet, under your bed, or on a shelf in your garage or basement. In the beginning, you’ll be the business – typist, salesman, advertising department, bookkeeper and janitor – so, much will depend upon your overall business acumen. Those areas in which you lack experience or feel weak in, buy books or tapes and enhance your knowledge. You don’t have to enjoy typing, but you should have better than average proficiency. Your best bet in selling your services is to do it all yourself. Every business in your area should be regarded as a potential customer, so it’s unlikely you’ll have to worry about who to call on. Begin by making a few phone calls to former bosses or business associates – simply explain that you’re starting a typing service and would appreciate it if they’d give you a call whenever they have extra work that you can handle for them. Before you end the conversation, ask them to be sure to keep you in mind and steer your way any overload typing jobs that they might hear about. The next step is “in-person” calls on prospective customers. This means dressing in an impressively professional manner, and making sales calls on the business people in your area. For this task, you should be armed with business cards (brochures also help), and an order or schedule book of some sort. All of these things take time to design and print, so while you’re waiting for delivery, use the time to practice selling via the elephone. At this stage, your telephone efforts will be more for the purpose of indoctrinating you into the world of selling than actually making sales. For your business cards, consider a free-lance artist to design a logo for you. Check, and/or pass the word among the students in the art or design classes at any nearby college, art or advertising school. Hiring a regular commercial artist will cost you quite a bit more, and generally won’t satisfy your needs any better than the work of a hungry beginner. Be sure to browse through any Klip Art books that may be available – at most print shops, newspaper offices, advertising agencies, libraries and book stores. The point being, to come up with an idea that makes your business card stand out; that can be used on all your printed materials, and makes you – your company – unique or different from all the others. At any rate, once you’ve got your logo or company design, the next step is your local print shop. Ask them to have the lettering you want to use, typeset in the style you like best – show them your layout and order at least a thousand business cards printed up. Everybody that you call on in person, be sure to give them one of your business cards. And now, you’re ready to start making those in-person business sales calls. Your best method of making sales calls would be with a business telephone directory and a big supply of loose leaf notebook paper. Go through the business directory and write down the company names, addresses and telephone number. Group all of those within one office building together, and those on the same street in the same block. Be sure to leave a couple of spaces between the listing of each company. And of course, start a new page for those in a different building or block. Now, simply start with the first business in the block, or on the lowest floor in a building and number them in consecutive order. This will enable you to call on each business in order as you proceed along a street, down the block, or through a building. You’ll be selling your capabilities – your talents – and charging for your time – the time it takes you to get set up and complete the assignment they give you. You should be organized to take work with you on the spot, and have it back at a promised time; arrange to pick up any work they have, and deliver it back to them when it+s completed; and handle dictation or special work assignments by phone. You should also emphasize your abilities to handle everything by phone, particularly when they have a rush job. Establish your fees according to how long it takes you to handle their work, plus your cost of supplies – work space, equipment and paper – then fold in a $5 profit. In other words, for a half hour job that you pick up on a regular sales or delivery call you should charge $10. Only make copies on the very best of dry paper copying machines, and only for 50 copies or less. More than 50 copies, it’ll be less expensive and you’ll come out with a better looking finished product by having them printed on a printing press. When you furnish copies, always fold in your copying or printing costs plus at least a dollar or more for every 50 copies you supply. Start lining up your friends to do the work for you – girls who work all day at a regular job, but need more money; and housewives with time on their hands. You tell them what kind of equipment is needed, and the quality of work you demand. You can arrange to pay them so much per hour for each job they handle for you – judging from the time you figure the job would take if you were doing it; or on a percentage basis. I feel the best arrangement is on an hourly basis according to a specified amount of time each job normally takes. Whenever, and as soon as you’ve got a supply of “workers” lined up, you turn all your current assignments over to them, and get back to lining up more business. If you’re doing well selling by phone, and your area seems to respond especially well to selling by phone, then you should immediately hire commission sales people. Train them according to your own best methods and put them to work assisting you. Your salespeople can work out of their own homes, using their own telephones, provided you’ve got your area’s business community organized in a loose leaf notebook style. All you do is give them so many pages from your notebook, from which they make sales calls each week. Even so, you should still make those in-person sales calls. If for some reason you get bogged down, and can’t or don’t want to, then hire commission sales people to do it for you. Generally, women selling this type of service bring back the most sales. And for all your commission sales people, the going rate should be 30 percent of the total amount of the sale. Point to remember: Sooner or later, you’re going to want to hire a full-time telephone sales person, plus another full time person to make in-person sales calls for you – Eventually, you want workers to handle all the work for you, and sales people to do the selling for you – So the sooner you can line up people for these jobs, the faster your business is going to prosper. Later on, you’ll want a sales manager to direct your sales people and keep them on track, so try to find a “future sales manager” when you begin looking for salespeople. Your basic advertising should be a regular quarter page ad in the yellow pages of both your home service telephone directory and the business yellow pages. You’ll find that 50 percent of your first time clients will come to you because they have an immediate need and saw you at in the yellow pages, so don’t skimp on either the size or the “eye-catching” graphics of this ad. A regular one column by 3-inch ad in the Sunday edition of your area’s largest newspaper would also be a good idea. Any advertising you do via radio or television will be quite expensive with generally very poor results, so don’t even give serious consideration to that type of advertising. By far, your largest advertising outlays will be for direct mail efforts. You should have a regular mailing piece that you send out to your entire business community at least once a month. This is handled by sending out 200 to 500 letters per day. or this, you should obtain a third class postage permit or else these postage costs will drive you out of business. Your mailing piece should consist of a colorful brochure that describes your business. It should explain the many different kinds of assignments you can handle – a notation that no job is too small or too large – and a statement of your guarantee. Do not quote prices in your brochure – simply ask the recipient to call for a quotation or price estimate. It’s also a good idea to list the background and experience of the business owner, plus several business testimonials and/or compliments. You could also include a couple of pictures showing your workers busy and actually handling secretarial assignments. The most important part of your brochure will be your closing statement – an invitation, indeed – a demand that the recipient call you for further information. All of this can very easily be put together in a Z-folded, 2-sided self-mailer. Again, look for a free-lance copywriter and artist to help you put it together. Once you’ve got your “dummy” pretty well set the way you want it, make copies of it, and either take it or send it to several direct mail advertising agencies. Ask them for their suggestions of how they would improve it, and for a bid on the cost if you were to retain them to handle it for you. Listen to their ideas and incorporate them where – and if you think they would make your brochure better. And, if one of them does come in with a cost estimate that’s lower than your independent, “do-it-yourself” costs, then think seriously about assigning the job to them. This is definitely the most important piece of work that will ever come out of your office, so be sure it’s the very best, and positively indicative of your business. This will be the business image you project, so make sure it reflects the quality, style and credibility of your business – your thinking, and your success. Your brochure should be on 60-pound coated paper, in at least two colors and by a professional printer. The end result is the Z-folded brochure – Z-folded by the printer – with your third class mailing permit indicia showing on the cover side. This cover side should be flamboyant and eye-catching. You want your mailing piece to stand out in the pile of 50 or 60 pieces of other mail received by the recipient. When you’re ready to mail, simply take a couple of cartons of your brochures to an addressing shop, have them run your brochures through their addressing machine, loaded with your mailing list, bundle them and drop them off at the post office for you. This takes us back to the planning on how to compile your mailing list. I suggest that you begin with Cheshire Cards by Xerox. You type the name of your addressee on the cards, maintain these cards in the order of your choice, take your boxes of cards to the addressing shop whenever you have a mailing, and there+s no further work on your part. The addressing shop loads their machine with your cards, prints the address on your cards directly onto your brochures, and gives the cards back to you when the mailing is completed. A mailing of 100,000 brochures, via this method – generally could be completed and on its way in one 8-hour day. In essence, you’ll want to solicit business with a regular routine of telephone selling, in-person sales calls at the prospective client’s place of business, media advertising and direct mail efforts. All of these efforts are important and necessary to the total success of your business – don’t try to cut corners or spare the time or expense needed to make sure you’re operating at full potential in these areas! In addition to these specific areas, it would be wise for you to attend chamber of commerce meetings, and join several of your area civic clubs – you’ll meet a great number of business leaders at these meetings and through their association, you will gain a great deal of new business – and even help in many of your needs. Once you’re organized and rolling, you can easily expand your market nationwide with the installation of a toll free telephone and advertising in business publications. Perhaps you can add to your primary business with a “mailing shop” of your own – the rental of mailing lists – specialized temporary help services – telephone answering services – and even survey work. The “bottom line” thing to remember in order to achieve total success, is planning. Plan your initial operation through from start to finish before you even think about soliciting your first customer. Get your operational plan down on paper – itemize your needs, estimate your costs, line up your operating capital, and set forth milestones for growth. Set profit figures you want to be realizing 3 months… 6 months… l year… 2 years… and 3 years from your business start-up date. Learn all you can about the “support systems” involved in operating a profitable business – planning, advertising, selling, bookkeeping, and banking – and continue to update your knowledge with a program of continuous learning. 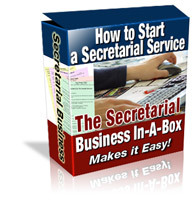 Do your homework properly, and there’s just no way you can fail with a Home-Based Secretarial Service.